From the time Dr. Mark Goldstein was a little boy—even before he had his first dog—he was fascinated by creatures both domestic and wild. After graduating veterinary school at Cornell University, he became a veterinarian in clinical practice, then director of zoos in Boston and Los Angeles, then head of a progressive humane society where he advocated for animal welfare. During his extraordinary 30-year career, Dr. Mark has accrued a lifetime of experiences working with all sorts of animals and the people who care for them. Dr. Mark's life with animals taught him more than how to be a great doctor, it taught him how to live life. The stories in this book reflect those lessons; they will make you laugh and cry as they entertain and amaze you. Each real-life experience sheds light on the challenges and hard work of the talented individuals who work in the world of animal welfare. These are stories that illustrate the tremendous impact animals have on our daily lives—they are hallmarks of the sacred importance of the human-animal bond. Without warning, I felt a solid leathery wall propel my body forward with such enormous force that I was lifted off my feet. It was futile to push back against such power, and I next found myself thrust high in the air, soaring forward an astonishing thirty feet before slamming into the ground at the edge of the island. As a small boy it had irritated my mother to no end when a fly or mosquito innocently wandered into the house, and I would turn the lights off so she couldn't see to annihilate it with her swatter. Now in an ironic twist, I had become the annoying pest, and the swatter was the muscular trunk of an irritated elephant named Donia. On the island, home to a small herd of elephants, Donia was the dominant matriarch. And although the crumpled 'pest' she had so easily flicked away presented no real threat to her, she still came at me with her 12,000 pounds driven by the same nonchalant ferocity as my mother with her swatter, intent on ridding her space of an uninvited nuisance. As soon as I landed, charging footsteps shook the ground, filling the air with a thick cloud of dust. Before I could even begin to process my dire situation, a tremendous weight came down on top of me, squeezing the air from my body. Thanks to my training, I knew that when an elephant attacks, it will instinctively put its head down on its antagonist and raise its back feet, tipping all its weight forward and crushing the life out of its victim. This natural behavior is often used by circus elephants performing headstand tricks as a part of their act. Unfortunately for me, this was no circus trick, and I knew that, unless I managed to free myself, my veterinary career would be over before it started. 'Elephant Island' was located in Section 5 of Lion Country Safari in Loxahatchee, Florida. Loxahatchee was officially a suburb of West Palm Beach, but to me as a young adult from New York, it appeared more like a suburb of the Everglades. The safari park had opened just five years before, in 1967, as America's first drive-thru African wildlife preserve. The grounds consisted of a 640-acre park in which hundreds of exotic animals roamed freely among visitors safely 'caged' in their cars as they drove along a scenic eight-mile safari trail. Of the preserve's six sections, four were inhabited by over a hundred lions living in prides and a herd of elephants on an island, while the other sections were occupied by zebras, giraffes, ostriches, white rhinoceroses, chimpanzees, and a dazzling array of other animals. After completing my second undergrad year at Cornell University, I made the long drive down from New York and arrived in Florida for the job early in the summer of 1972. I couldn't have been more excited to have landed a three-month summer job there. Miraculously, I had gotten the job after writing a letter to the head ranger on a whim, and he subsequently interviewed me over the phone. At the end of the road was a line of huts with palm-frond roofs and signs directing either to the left for the offices or to the right for the visitors' entrance. I followed the signs to the left, walked into the offices known by the employees as 'Lion Base,' and explained to the front desk staff who I was and why I was there. If I hadn't been sure about my decision before, the friendly greeting, the smell of the animals on the breeze, and the squawking of the African Gray parrot behind the desk reassured me that I had made the right choice. I was escorted into a back office where a weather-beaten man dressed in safari clothes sat behind a desk. He introduced himself as Charles Durr, the park's head ranger with whom I had spoken earlier that year. We shook hands, and he introduced the man next to him as Bill McGrath, the assistant head ranger. Like Charles, Bill was dressed in a khaki safari outfit, but he was nowhere near as weathered as Charles. As they asked me about my drive from New York and began introducing me to the basics of the job, their casual style and their kind, easygoing attitudes put me at ease, and I immediately felt comfortable around my new coworkers. As I took in my surroundings during the meeting, I was awed by the vast collection of wildlife books in Charles's office, and I couldn't help but admire the array of equipment he had on display. There was everything from walkie-talkies and firearms, to tranquilizing gear and an assortment of animal restraints, as well as a variety of medical instruments, much of which I had seen in books and on TV, but never dreamed I'd see, let alone handle, in real life. The three of us briefly chatted. I asked to have two days to find a place to live for the summer, and then I'd be ready to work. As we finished talking, the radio on Charles's desk chattered out that some assistance was needed on Elephant Island. At this point, I was convinced I had died and gone to heaven. I was actually going to get up-close-and-personal with the animals on my first day! I also felt an immediate connection with Bill; he was easy to talk to, and I knew I was going to learn a great deal from him. I followed Bill out the back door and into a zebra-striped Jeep. As he started the engine, Bill updated me on the plan: we were going to Section 5 to help a man named Mike secure the elephants for the night. I smiled and nodded as if I knew what he was talking about although, of course, I didn't. 'Great!' I said, and I genuinely meant it, even though I had no clue what I was getting myself into. We drove into the park through the front gate on a service road, passing by the cars that held visitors slowly entering the park. A twenty-foot-high fence towered on each side as we rumbled over a cattle guard (a shallow ditch with bars or slats across it that are spread far enough apart to keep hoof-stock from crossing over, but not people or vehicles). We had now entered Section 1, and, in my mind, it seemed like we had somehow been transported halfway around the world in the blink of an eye. I was suddenly surrounded on all sides by animals typically confined to an African savannah or the two-dimensional pages of a book. Giant elands, delicate gazelles, and scores of other herd-dwelling animals roamed freely just outside our vehicle. We continued forward, and as we crossed the cattle guard entering into Section 2, Bill pointed to an elevated cabin on stilts about thirty feet above, and said, 'That'll be your new home for the next while.' I would be on assignment in the watchtower to look out for the safety of the park's visitors and animals. The first thing that I realized about Section 2 was that instead of appearing like the plains we had just passed through in Section 1, this was lush with a vast variety of plants. As we took the next turn, I was again in awe to see in person something I had only seen in books and movies. There, crossing the road right in front of us, was a majestic pride of lions. A very mature male lion was in the lead, followed by two beautiful lionesses, and lumbering after them were a number of cubs. Bill pointed out that the two females before me were the actual lionesses used in shooting the widely acclaimed movie Born Free. As we waited for the lions to pass, Bill briefly checked in with the ranger on duty to care for the pride that day, and then we moved on. Plus you'll know the other animals are safe from them! I thought with a half chuckle. We continued moving forward and came to some thick hedgerows, very dense areas of foliage that were natural to the landscape and added to the scenery. 'See those hedgerows?' Bill asked. I wondered at both the dangers and excitement of such a task. ©2019 Mark Goldstein, DVM. All rights reserved. 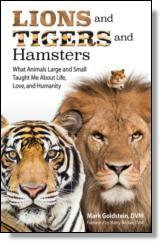 Reprinted from Lions and Tigers and Hamsters: What Animals Large and Small Taught Me about Life, Love, and Humanity. No part of this publication may be reproduced, stored in a retrieval system or transmitted in any form or by any means, without the written permission of the publisher. Publisher: Health Communications, Inc., 3201 SW 15th Street, Deerfield Beach, FL 33442. Mark Goldstein, DVM, has spent over 40 years caring, advocating, and fighting for the welfare of animals. The institutions he worked at are all recognized leaders in their respective fields and the variety of animals he worked with and his responsibilities were unique. He was a senior staff clinician in the medicine department at Angell Memorial Animal Hospital in Boston. After being hired to head the Boston Zoos, he led a turnaround for the failing inner city Franklin Park Zoo. "Dr. Mark" then moved west with his wife Kristine and their two daughters when he was appointed to lead the Los Angeles Zoo. He followed his heart to shine a light on the importance of the human-animal bond and took the helm at the San Diego Humane Society and SPCA where he oversaw the design, development, and completion of the "San Diego Campus for Animal Care." Many aspects of the campus, its programs and its unique partnership with the municipal animal care department have been copied numerous times both nationally and internationally. He has a BS in Animal Science and a DVM degree from Cornell University.